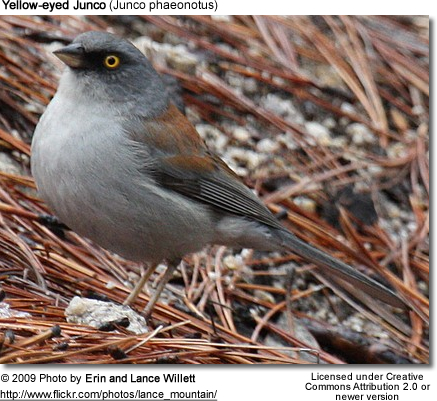 The Yellow-eyed Junco, Junco phaeonotus, is the only North American junco with yellow eyes. 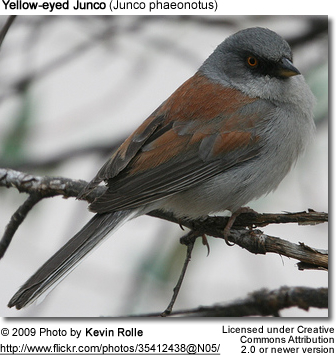 They are also known as Mexican Junco, Baird's Junco, Chiapas Junco or Guatemala Junco. They are found in Mexico, extending into some of the mountains of the southern tips of the U.S. states of Arizona and New Mexico. 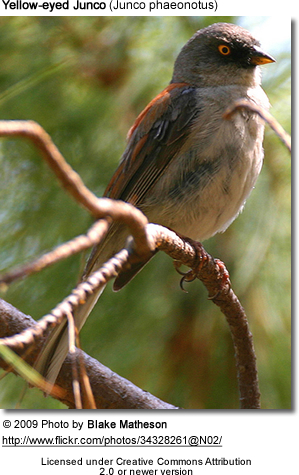 They are not generally migratory, but may move to nearby lower elevations during winter. The female species lays 3-5 pale gray or bluish-white eggs in an open nest of dried grass two to three times a year. Incubation takes 15 days. The chicks leave the nest 2 weeks after hatching. Their diet consists mainly of seeds, berries and insects.